Indian Air Force Notification is out. Indian Air Force is recruiting for 100+(Not Specified) Group Y (Non-Technical) Barrackpore Govt Job Posts. You can check Indian Air Force - Indian Air Force last date, download Indian Air Force notification, visit Indian Air Force official website and check other Indian Air Force Vacancy details.Complete Vacancy and recruitment Details about 100+(Not Specified) Group Y (Non-Technical) Barrackpore Govt Job vacancies in Indian Air Force are provided below by JobSarkari.Com only for you. 26/02/2019 Physical Fitness Test & Written Test Hoogly, East Midnapur, Jhargram, Purulia & West Burdhwan districts of State of West Bengal and all districts of State of Sikkim. Jalpaiguri, Alipurduar and Cooch Behar districts of State of West Bengal. ASC (Near Palta Gate), Air Force Station Barrackpore, 24 Parganas (North), West Bengal 743122 up to 10 AM on 26 February 2019 and 01 March 2019. Q. 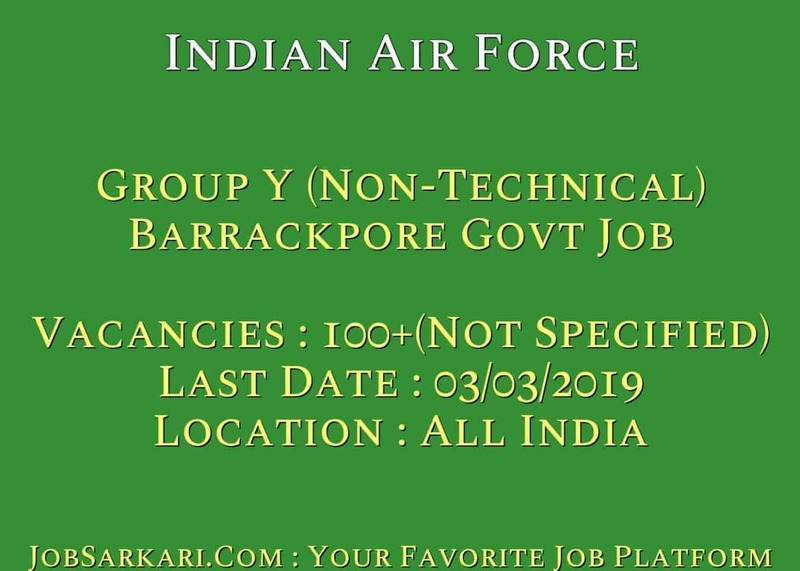 What is the Last Date For Indian Air Force Group Y (Non-Technical) Barrackpore Govt Job Vacancy ? A. 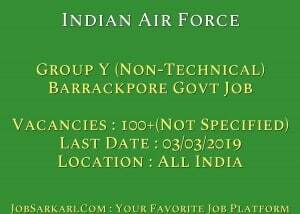 Last Date for Indian Air Force Group Y (Non-Technical) Barrackpore Govt Job Posts is 03/03/2019. Q. What is the Form Type of Indian Air Force Group Y (Non-Technical) Barrackpore Govt Job Recruitment ? A. The Form Type for Indian Air Force Group Y (Non-Technical) Barrackpore Govt Job Posts is Offline. Q. How many vacancies are available in Indian Air Force Group Y (Non-Technical) Barrackpore Govt Job Posts ? A. There are about 100+(Not Specified) Vacancies in Indian Air Force Group Y (Non-Technical) Barrackpore Govt Job Posts.